After adding a shape, caption, or text box, use Articulate Storyline's drawing tools to quickly customize it. Select the object you want to customize, go to the Format tab on the ribbon, then use any of the following tools. Shape Styles: The preset shape styles let you quickly change the appearance of an object. Click one of the thumbnails in the Shape Styles drop-down to apply it to the selected object. Shape Fill: Use this drop-down to change the object's fill. See the guidelines below. Click any color to apply it to the object. The available colors are controlled by your theme colors. To remove the fill altogether, click No Fill. To choose a custom color, click More Fill Colors. To pick a color from anything visible on your screen, click Eyedropper, then click the color you want to match. To fill the object with a picture, click Picture and browse to the image you want to use. To fill the object with a gradient, scroll to Gradient, then choose a preset option or click More Gradients. To fill the object with a texture, scroll to Texture, then choose a preset option or click More Textures. Shape Outline: Use this drop-down to change the object's outline. See the guidelines below. Click any color to apply it to the outline of the object. The available colors are controlled by your theme colors. To remove the outline altogether, click No Outline. To choose a custom color, click More Outline Colors. To change the outline's thickness, scroll to Weight, then choose a thickness or click More Lines. To change the line style, scroll to Dashes, then choose a style or click More Lines. Shape Effects: Click this option to add a shadow, reflection, glow, or soft edges to the selected object. See the guidelines below. Shadow: Choose a preset shadow effect or click Shadow Options to add a custom shadow. Reflection: Choose a preset reflection effect. Glow: Choose a preset glow effect. The glow colors are controlled by your theme colors. Soft Edges: Choose a size for the soft edges effect. Bring Forward/Send Backward: Click these options to bring the object forward or send it backward one layer on your slide. To send it to the very front or back of the slide, click the small arrow next to one of the choices and choose Bring to Front or Send to Back. Tip: In addition to the Bring Forward and Send Backward options, another way to change the layer order of objects is to use the timeline. All the elements in the timeline are listed in the same order in which they're layered on the slide—in other words, the topmost item in the list is the closest to the front (or top) of the slide. To change the order, just select an item on the timeline and drag it up or down in the list. Align: Use this drop-down to align objects with with the slide or with one another. First, click Align and choose either Align to Slide or Align to Selected Objects. Next, click Align again and choose one of the alignment options (left, center, right, top, middle, or bottom). To space multiple items evenly, choose Distribute Horizontally or Distribute Vertically. Group: Grouping is a handy way to move, resize, rotate, flip, or change other attributes of several objects all at the same time—as if they were a single object. To group objects, use Shift+click to select two or more objects, then choose Group to group them. To ungroup objects, choose Ungroup. To regroup items that were previously part of a group, choose Regroup. Rotate: Use this option to rotate selected objects. 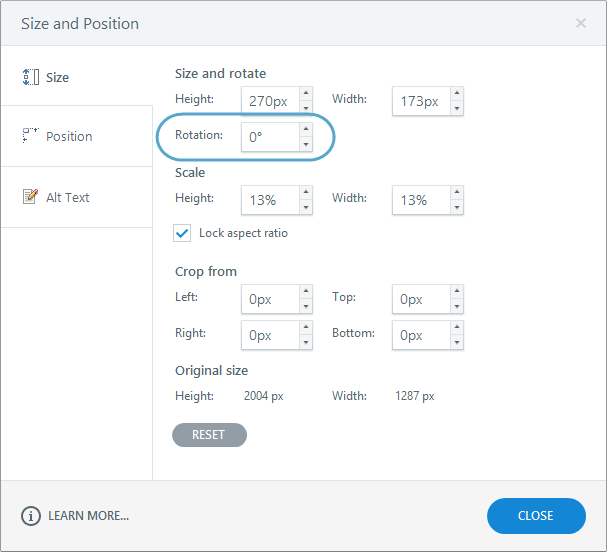 Choose one of the rotation options or click More Rotation Options to enter a specific rotation value (shown below).